This Month’s gems are a pair of beautiful emission nebulae in the constellation Auriga. Of the two, IC405 is the more famous as it is the well-known “Flaming Star” nebula, a region of H-alpha emission, but with an amazing reflection nebulosity in the “head” of the nebula caused by the reflection of short (blue) wavelengths of light by dust particles. The star that lights up IC405 is AE Aurigae, a runaway star that was thrown out of the Trapezium, in Orion, millions of years ago. So IC405 is being lit up by a star that just happens to be passing through, and at some point it will “go out” as AE Aurigae continues on its travels. 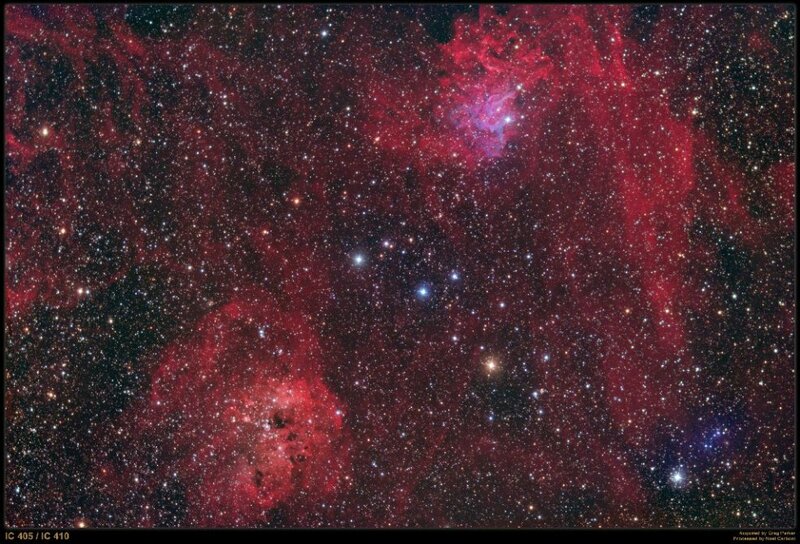 You can see from my image below that the field of view required to capture both IC405 and IC410 in a single frame is quite large. My image is 3.33 by 2.22 degrees, and as you can see I didn’t do a particularly good job at capturing the whole of IC405, I needed to rotate the camera by a few degrees to get IC405 in completely. However, to be on the safe side, you should probably aim for a field of view around 4 by 2.5 degrees, and this of course might mean creating a mosaic. These nebula are fairly bright so that exceptionally long subs are not required. Imaging at f#4.5 meant 10-minute subs for the colour data for the M25C. However, as per any region of emission nebulosity, your image will benefit greatly by the addition of some narrowband H-alpha data. I used 20-minute subs for the H-alpha data using the M25C. The beautiful blue reflection region does not benefit from narrowband imaging as this type of radiation is broadband. November means long dark nights, so it is probably worth spending at least two evenings on this one, one evening to collect the colour data, and a second evening to get the H-alpha. This entry was posted in IOM. Bookmark the permalink.